Stone circles fit in to many situations and designs. 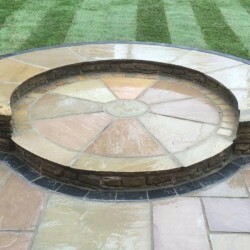 Customers never cease to amaze us with their ideas for utilising these circular stone pavers. Each circle is supplied as a complete "kit" including the centre pirce, radiating circle pieces and the squaring off kit. They are available in many colours which complement the paving ranges. Also, three sizes are offerend depending on your requirements and size of your design. Stone circles fit in to many situations and designs. Customers never cease to amaze us with their id..